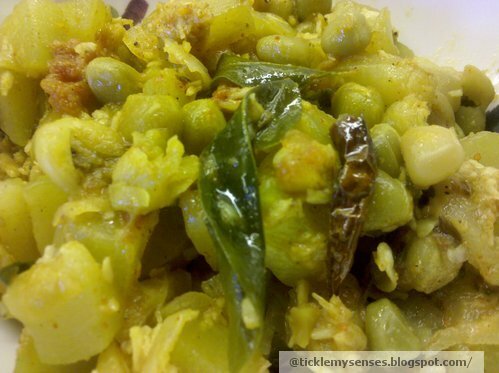 This is a tasty vegetable dish combining cooking cucumber/vegetable marrow and marrow fat peas, flavoured using the popular spicy mangalorean baffat powder. Method: 1. Wash and peel skin of marrow. Then dice into 1/2 inch pieces. 3. This step is optional if using marrow fat peas: Soak the dried peas in water for 1 hour minimum. Pressure cook in 1 cup water with a pinch of turmeric, handful of coriander leaves, 1/2 chopped tomato and salt to taste for 3 whistles on a medium flame. Wait for pressure to drop before opening cooker. Once done add cooked peas to vegetable and give a good stir. 4. For seasoning heat 3 tsps oil add crushed garlic flakes and fry till brown, add small dried chillies, cumin seeds and hing, when aromatic pour over vegetable. Give a good stir. Cucumber baffat sukke is ready. Serve hot with plain rice and daaliso saar. Alternatively serve with chappatis/ dosas. Ready made Baffat powder is available in all Mangalorean food stores.